Hostel Fish kohteessa Denver, Yhdysvallat: Varaa nyt! Valid CC must be on reservation to be collected up to 2 weeks prior to check in date. 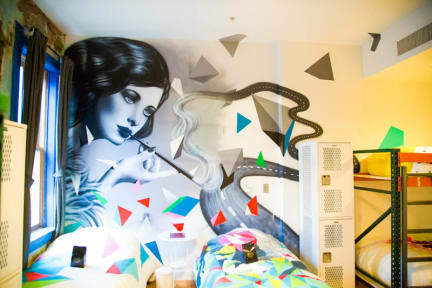 Hostel Fish is THE premiere hostel in Denver. Come stay with us! We have a speakeasy style bar, co-working space in the reading lounge, and customized sleeping rooms. Shhh, don't tell your mom, but this place used to be a brothel. Seriously. Our location is in the historic Airedale Building that once housed call girls, but now we house a vibrant community of young adults and the young at heart. Our shared room accommodations are all stocked full of unique decor and experiences! Each room has plush mattresses and linens, key card access, and personal lockers. Guests have access to our full bar, modern kitchen, multiple lounges, and outdoor patio. We also offer a HAPPY HOUR everyday from 7-8pm where each guest receives a FREE DRINK from our bar to start their night off right! You will be experiencing the height of what a hostel can be, all of which focuses around our core focus of being clean and comfortable and to provide a Safe atmosphere for badass travelers. We believe that shared rooms and neo-urbanism, when combined, create an epicenter for those 'seekers of life's adventures' to meet each other and foster new friendships. Utilize our staff for 24/7 Concierge service. We love being able to show off our favorite spots in the Mile High City! Our friendly staff live on site to make sure your stay is as comfortable as possible. We look forward to hosting you! décor that honors the building’s past. With delicious, responsibly-sourced food, the upscale, gastrobrothel-inspired menu includes fresh, crave-able takes on flatbread that will keep your mouth watering. Be warned that the noise from downstairs may be heard in the Hostel. With the music venue downstairs, we do offer complimentary ear plugs to any guest who is a light sleeper. You honestly do not need a car while staying at Hostel Fish, since we are the only hostel located in downtown Denver. Being right in the heart of the baseball district, we are just a few minutes walk from Coors Field, Union Station, 16 St. Mall, Pepsi Center, Larimer Square, and much more. No need to pay the extra cost for a Lyft or Uber! Also, with the convenience of having access to Denver's Public Bike system (B-Cycle), you can travel in style while taking advantage of our 300 days of sunshine. Cancellation policy: 24 hours before 3PM check in time of reservation. Cancellation and day change requests taken by email only.